Nothing in this article changes the overall conclusion that MU has significant defensive issues, but there does appear to be a sizable element of being unlucky. According to Synergy Sports Technology, opponents are scoring 1.459 points per possession (ppp) on unguarded catch and shoot (C&S) plays. That is, the ball is passed to a shooter, who doesn’t dribble and takes a jump shot without a Marquette defender on him. The significant majority of these unguarded C&S plays are 3-point attempts. When a team has an open look off the C&S against Butler, they score an incredible 0.54 ppp less than they do against Marquette. 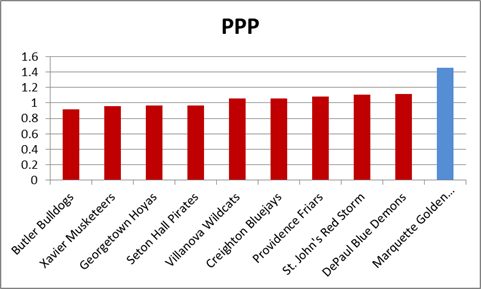 On average, the nine other Big East teams give up 1.025 ppp on unguarded C&S plays, a difference of 0.434 compared to MU. Nationally, Marquette’s unguarded C&S defense ranks #348 of 351 teams. Quick math says this could be hurting Marquette by around 1.5 points per game and ~3% on defensive 3FG%. (MU gives up 4.9 unguarded C&S shots per game; if they allowed 0.434 less per shots, that’s 2.1 points. We then adjust it downward for estimated offensive rebounds and points off those extra possessions). The effective field goal percentage that Marquette allows on unguarded C&S plays is 73.0%. No other Big East team allows more than 55.9%. Could it be that shooters are more comfortable against Marquette than other defenses because of the personnel trying to close out on shooters? There could be some of that. Nonetheless, a significant factor in teams hitting their open shots against Marquette at an unusually high clip may simply be bad luck for this year’s Warriors. On a related note, C&S plays (guarded and unguarded) against Marquette as a percent of all plays is about average compared to all Big East teams.Further, Marquette defensive split of guarded (preferred) vs. unguarded C&S plays compared to its conference peers is favorable (only 29.5% of C&S plays are unguarded for MU’s defense, good for third best in the Big East).In other words, MU isn’t allowing an obscene amount of unguarded C&S attempts… it’s just that opponents are converting their attempts against MU at an extremely high rate. The Big East’s best (highest ppp) catch & shoot individual player this year (overall season)? Marquette’s Markus Howard, and it’s not a close competition.